We have flown with so many pilots over the years it’s hard to remember them all, and that’s probably a good thing. Pilots tend to have a reputation which can range from being famous to infamous and everything in between. On a normal day, in a casual conversation, they will probably refer to themselves as glorified taxi drivers, but I beg to differ. To watch a helicopter pilot deftly handle a Hughes 500 or Bell Jet Ranger, inserting it through a seam in the forest and depositing the passengers safely in a tight river valley or to see a bush pilot fight crosswinds and foot high waves to land a piston Beaver on a remote lake is to know that you are in the hands of a capable professional. And we flew with a lot of them. I can recall my first helicopter flight in eastern Newfoundland and probably still have the photographs squirrelled away in my collection somewhere. To see the coastline I was intimately familiar with at sea level from a vantage point of several thousand feet in the air, brought a sense of wonder and amazement and instilled in me a seemingly insatiable thirst for flying. 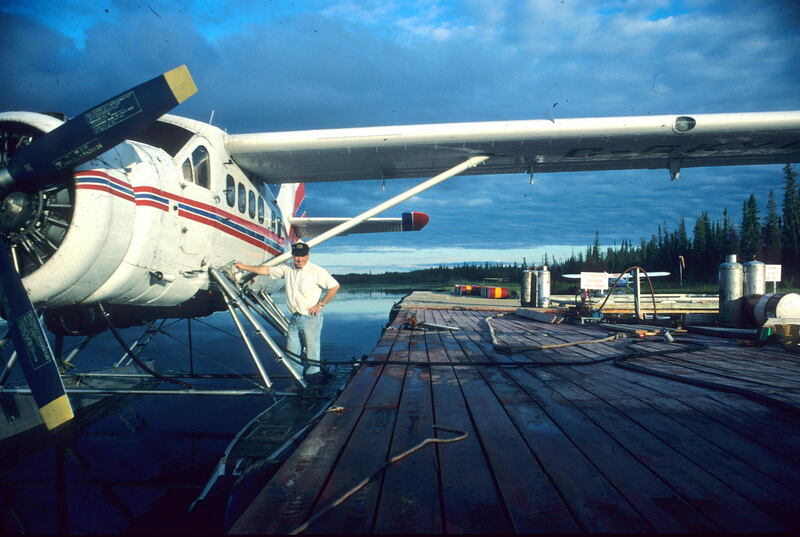 Bush planes brought another whole dimension, enabling canoe trips on lakes and rivers in the North and forays into country that was otherwise inaccessible. Flying into the Nahanni or the Williams River Delta was more than enough of a tease to make you want to see as much of the country as possible, and flying enabled you to do just that. Of course, our work required an ability to travel by aircraft of all types and there was usually a lineup of people who wanted to take advantage of any opportunity to get up in the air. Being one of the largest national parks in the world, Wood Buffalo’s sheer size required extensive use of aircraft to move people and supplies, to fight forest fires, to conduct research and monitoring and to just get around. And that is where we put in lots of flying hours. Most flights were highly sought after, although there were a few exceptions. Smoke patrols were notoriously long (imagine flying completely around the border of Switzerland) as were monitoring flights to find fifty radio collared bison tucked away in the forest, meadows and prairies of the Northern Plains. If you didn’t have a stomach for it, you were doomed to spend an unbearably long time in a confined space with someone who literally had your life in their hands, (although sometimes it seemed more like they had your bladder in their hands). And you hoped that all was good in their lives. After taking an Aircraft Management Course in Yellowknife in which one of the speakers pointed out that most aircraft injuries and fatalities are a result of the pilot having too much going on in their minds, especially related to matters at home, I routinely got into a plane or helicopter and semi-jokingly asked the pilot “How’s your love life?” Only partially joking, remember. Thankfully, all ended well, although, truth be told, there were times when I wondered how in the name of God we got into some of the things we got into, and more importantly, how we got out. Our trip into Nahanni National Park Reserve was a case in point. After being weathered in at Fort Liard for a couple of days our pilot was under pressure to clear up the back log of scheduled trips so when he saw a break in the weather we were off. Flying through the MacKenzie Mountains at the best of times is no easy feat and as our pilot deftly maneuvered the aircraft above the river canyons towards Rabbitkettle Lake we could see a look of concern as he found his way up and over a col and dropped into a bowl on the other side, only to realize that we were quickly being surrounded by fog. He circled to backtrack but the fog had pulled in behind us, obliterating our escape route. Usually talkative throughout the flight he tuned us out and a crease of worry canyoned across his forehead. Landing was not an option. Suddenly a patch of blue sky opened up and we were able to sneak out of the bowl and continue towards the lake. Only after we had completed our ten day trip on the Nahanni did we find out how close we came to not making it to Rabbitkettle and that trip of a lifetime. Luckily, or should I say thankfully, we chalked up hundreds of hours in planes and helicoptors without incident, thanks to the very capable men and women who sat at the controls and got us safely there and back again. To fly shotgun on a caribou survey or backseat on a birddog flight was to spend time in the air with people whose passion for flying matched our passion for parks. They were and continue to be an integral part of parks and protected areas management, whether conducting anti-poaching patrols, wildlife surveys, forest fire fighting, performing rescues or the myriad of other tasks they are called on to tackle. Many times they even play an active role in the field work – being an extra set of hands to get a radio collar on a caribou or data entered on a data sheet. They do it all in the line of duty and often perform above and beyond the call of duty, in weather that ranges from clear skies to howling storms. They are without doubt, some of the unsung heroes of the work carried out in parks and protected areas in Canada and around the world.